At first glance, a newbie to PDP might think this topic less than exciting. However, if you've ever made a TeamScan or JobScan in PDPworks 2.3, this topic should pique your interest. In 2.3, if you wanted to have TeamScan members listed in alphabetical order, you'd have to search for them individually and then build the Team with that specific order. Now, in PDPworks 4.0 all of that has changed! The following example is about creating a TeamScan, but it is just as applicable to building a Job Model or creating a Side-by-Side report or just searching for surveys and reports. When you create a team, you can now search for your members by name (full name or any part of the name), title, or email. You may also search by date, folder, or even the type of report! Once you find individuals to add as members of the team, all you have to do is click the checkbox next to the name then click the Add to Team button. NOTE: The check boxes you mark are NOT sticky. Be sure to click the Add to Team button before changing search options. Any marked check box will unmark (deselect) when you do a new search or change search options. If your people have taken the ProScan numerous times over the years, you may find reports from multiple dates, the date each survey was completed. You will want to choose a report from the latest survey date so that you get the most current data in your TeamScan. You may have multiple reports from the same survey. 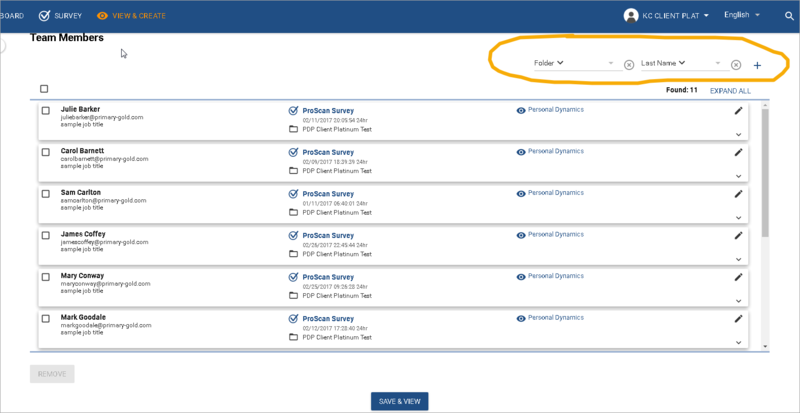 As in the previous version of PDPworks, it does not matter which report (from the same date) you choose, because you are actually adding the survey data that generated the report rather than the report itself. Any sort option can be used to sort the list in either ascending or descending order. Finally, we're sure you'll be pleased to know that you can combine any of these variables. If you wanted to, you could sort by folder name in ascending or descending order and then by last name (ascending or descending order) for each person within each folder. See the example of above for this scenario.